The non-dualistic philosophy (Advaita Vedanta) has been beautifully summarized by the great Hindu scholar and philosopher Ādi Śankarācārya in just six stanzas. This famous poem is popularly known as Atma-Shatakam (also known as Nirvana Shatakam). According to the legends, Ādi Śankarācārya, at a young age of eight years, traveled towards North India from Kerala in search of his guru. While wandering in the Himalayas, seeking to find his guru, he encountered a sage who asked him, "Who are you?” He replied with an extempore Composition (the Atma-Shatakam) that brought out the Advaita Vedanta philosophy – the essence of which is that "Nirvana" is complete equanimity, peace, tranquility, freedom and joy. "Atma" is the True Self. 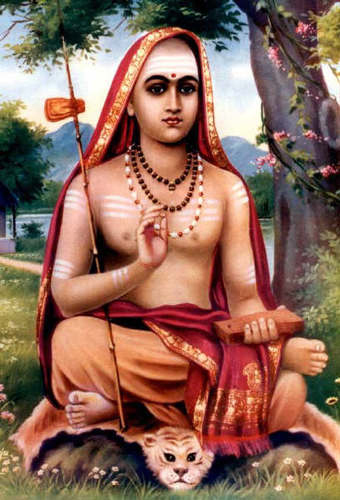 The sage the boy was talking to was Swami Govindapada Acharya, who was, indeed, the teacher he was looking for. nor the reflections of inner self (chitta). nor the fire, nor the wind . nor the five coverings (pancha-kosha). nor feelings of envy or jealousy. scriptures (Vedas), rituals or sacrifices (yagnas). or any object being observed or experienced. nor did I have a birth.